You can’t just dry only the surface of a floor or cabinet. Standing water, even if it’s for a short while, penetrates into the porous wood. In few months, it can turn into mold, which rots the wood and can create a health hazard – headaches and breathing trouble are among the symptoms. Using the newest drying equipment, our professional restoration team exposes the wood and dries it completely. If drying isn’t possible, the insurance company will cover the cost of replacing it. Carpet can be a great environment for bacteria. Most times the carpet has to be replaced. Insurance companies are aware that carpet can be completely dried only in rare cases, and they will pay for the carpet replacement. Our prices for homeowners without insurance, however, are very reasonable. You want to dry a wet vinyl floor correctly the first time. If you don’t, in a few months you’ll notice air bubbles. Now it’s too late and the floor must be replaced. 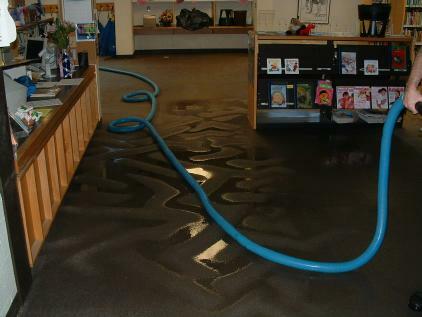 Drying it correctly at the beginning could have prevented replacing the floor.